Nanomaterials constitute a new category of materials used in society. The identification and mitigation of risks of these materials is crucial, and industries are required to ensure their safe during their production, use and end of life. However, a full risk assessment testing the multiple nanoforms of a material can be very expensive and time-consuming, especially if all data would have to be determined experimentally. 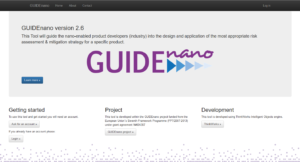 Innovation: EARTO member LEITAT and its partners developed a web-based risk assessment Tool, GUIDEnano Tool, a software for nanomaterial producers and users, to rapidly evaluate and mitigate the risks of nano-enabled products. It integrates a series of databases and advanced algorithms/ models to provide support in the prediction of human and environmental risks, as well as, in the application of the most appropriate risk management strategies. Impact expected: The use of GUIDEnano Tool allows the risk assessment to be made at lower cost and shorter time, which is significant for a company willing to ensure the safety of their nano-enabled product. This tool can help them optimise the developmental phase of a nano-enabled product and reduce the time to market. At a social level, this could help increase societal trust in nanotechnologies. The tool will soon be finalised in its current version, which is meant to evolve, and be accessible to end users. LEITAT is one of the leading Catalan RTO bridging academic knowledge toward industrial market applications by adding technological value for both products and processes through industrial innovation.